Actors Benedict Cumberbatch and Stephen Fry looked on as Sir Elton sang classics including Rocket Man, Saturday and I'm Still Standing at the Roundhouse in Camden, north London, as part of the 2013 iTunes Festival. The showman dedicated new song, Oscar Wilde Gets Out, to Fry for playing the Irish writer "brilliantly" in the eponymous film while Tiny Dancer was sung for support act Tom Odell. Dressed in typical flamboyant style in a tail coat encrusted with crimson sequins, Sir Elton - who suffered a recent health scare - told the crowd: "This is a magical time to be alive. "I have such a wonderful life, I have such a wonderful partner. "Music has been the biggest part of my life since I was three years old. "The best part is to play live, and to play live for you guys." Sir Elton, who was forced to pull out of a series of shows after being diagnosed with appendicitis earlier in the summer, added: "I want to say thank you to my record company. My record company in this country in this country have been absolutely amazing to me and I want to thank them for all the support they've given me. "And of course to my angel David (Furnish) out there. Thank you so much." 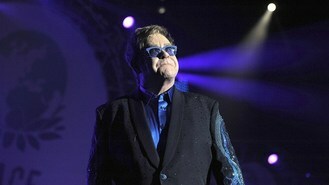 Sir Elton, 66, appears to have bounced back since having his appendix removed - so far this month he has been presented with the inaugual BRITs Icon award in recognition of his musical achievements, been declared a genius at the GQ Awards and performed a headlining set at Bestival.